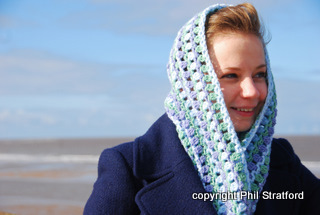 Anyway - whatever you like to call it, simply pop it over your head to wear it around your neck. 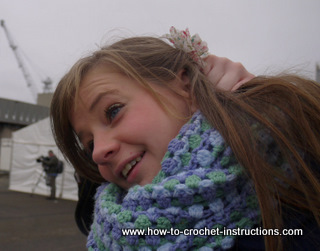 Wear it with the seam at the front if you intend to have it draped over your head. 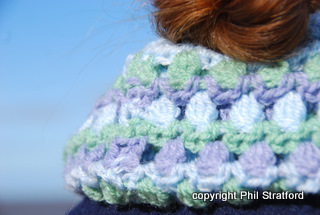 This cowl is made in the round. 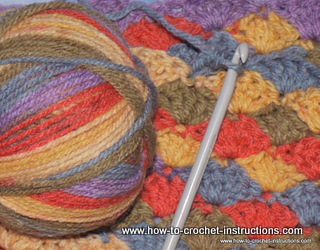 If it is easier for you, make it as a long rectangle instead and sew the ends together. The one in the photograph looks like it is made up of stripes from different balls. 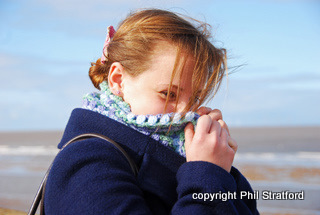 In fact it is made with a variegated yarn. You can of course make it with a plain yarn if you wish. You will need 3 100gram balls in different colours (A, B and C) of double knitting (UK weight) yarn and a 5.5mm hook. Or if you prefer, make it in one colour. With colour A make your base chain. 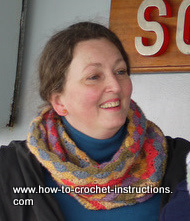 Repeat 2nd 3rd 4th and 5th rows until the cowl is wide enough to pull up over your head, ending with a 3rd or a 5th row.